Going into the 1970 World Cup in Mexico, England and Brazil were generally accepted to be the two strongest teams in the world and the fact that they had to meet in a group match first did nothing to lower the expectations. England were considered by many to have a stronger side than the one that lifted the World Cup four years earlier. Sir Alf Ramsey was still in charge and players from the World Cup winning side such as the Bobbies Charlton and Moore, Alan Ball, Gordon Banks, Geoff Hurst and Martin Peters were in their prime. They had been joined by midfielders Francis Lee and Alan Mullery, and defenders Tommy Wright, Terry Cooper and Brian Labone. As reigning champions, England had not had to qualify so they arranged a pre-tournament tour, playing the national sides of Columbia and Ecuador, to acclimatise to the heat and altitude. Brazil had the electrifying Jairzhinho and the amazing Pele from 1966, when they had had a disappointing tournament, not going through from the group stage. But they, and new players such Tostao, Rivelino, Paulo Cesar and captain Carlos Alberto, were making headlines as Brazil stormed their qualifying group, winning all six of their matches and averaging just under four goals a game, conceding only two. In their opening group match of the final tournament, Pele had tried to chip the Czech goalkeeper from inside his own half, only missing by a foot, on the way to a 4-1 win. European teams had to expect to be disadvantaged by the heat and altitude but these problems were exacerbated by the first intrusion of global television on fixtures, as noon kick-offs were arranged for European teams. FIFA believed that they had obviated these problems by allowing substitutions during the match for the first time. The temperature was in the high eighties as the match kicked off in Guadalajara but England looked comfortable from the start and twice threatened with long-range shots. One high lob from the right wing from Moore fizzed just passed the post, Ramsey having obviously decided that Felix Mielli, the Brazilian keeper, was a little dodgy. Then suddenly England’s keeper was called into spectacular action. On a quick raid down the right wing Jairzinho skipped passed Cooper and pulled back a cross to the far side of the penalty area. Waiting there to send a bullet header down toward the base of the left-hand post was Pele. He had already started to celebrate the goal before he saw Banks leaping “like a salmon leaping up a waterfall” (as Pele later put it) to tip the ball over the crossbar. Banks modestly refuses to believe that this was his best save but it is probably the finest, definitely the most improbable, save that the World Cup has ever seen. This galvanised the Brazilians and they began to tease and probe but the final thrusts always seemed to be repelled by Bobby Moore’s tackling, particularly on Pele. Considering the state of international football toady it is astonishing to see Pele helping Moore to his feet after another perfectly timed tackle, in a display of true mutual respect. It wasn’t all Brazil though, and England went close with almost a clone move of Pele’s header. Cooper overlapped down the right and crossed for Lee to send his diving header straight at the keeper, then going in with his foot as the keeper dropped the ball. To their credit, although the Brazilians were upset at this, they realised that Lee was obviously contrite and that it had been a 50-50 ball, so he had a right to go for it. Charlton then went close with a shot from outside the area. As the second half opened England were beginning to show early signs of wilting but again Moore’s tackles, on Tostao in particular, and Banks’ saves from Paulo Cesar and Rivelhino kept the Brazilians at bay. 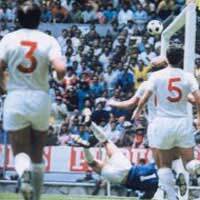 One run and shot from Rivelhino that Banks beat away was not unlike Maradona’s great goal against England in 1986. But they couldn’t hold out forever, and the goal came on the hour mark. Tostao for once managed to wriggle out of Moore’s grasp and flicked the ball over to Pele by the penalty spot. As he held the ball and three England defenders were drawn to him like flies, he slipped the ball to a now unmarked Jairzinho on his right-hand side who walloped the ball into the net from close range. England came back at Brazil immediately and went close with Charlton but were then hit on the break after sending everyone upfield for a free-kick. As the goal-scorer galloped toward the England goal Bobby Moore was tracking back, watching the ball intently. Jairzinho entered the penalty area and Moore chose his moment, sticking out his right leg and coming away with the ball as the Brazilian tumbled over. It was this tackle, not a tackle against Pele, as many think, that was immortalised in the 1996 Baddiel and Skinner anthem “Three Lions”. Ramsey used the substitutes rules to throw on Jeff Astle and Colin Bell for Bobby Charlton and Francis Lee, beefing up the strike force at the expense of midfield, and immediately Astle was presented with a chance. The Brazilian defence fluffed a deep cross from Cooper on the left, but Astle struck it wide as the keeper advanced. Another high cross was knocked back by Hurst for Ball whose shot beat the keeper but hit the bar. England kept up the pressure but couldn’t score and the match ended with Pele trying an audacious chip over Banks after another breakaway, England paying for their poor finishing with a 0-1 defeat. At the final whistle, the Brazilians leapt for joy as though they had already won the cup, so clearly relieved were they to have beaten the World Champions. The enduring images are those of Bobby Moore and Pele embracing each other and the obvious mutual respect that the two teams held for each other. In a way, Brazil had just won the cup. England later went out to West Germany in their quarter-final, despite being two goals up, and no other team mounted a serious challenge to Brazil as they swept Peru, Uruguay and then Italy aside, always scoring at least two more goals more than their opponents. No team took them closer than England.